Pour 1 tablespoon Kelapo Coconut Oil into a medium saucepan. Add black beans and set to a low heat. Pour 2 tablespoons Kelapo Coconut Oil in a skillet set to a medium heat. Put tortilla in skillet. 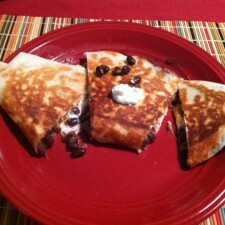 Add black beans, cheese and a dollop of Greek yogurt to one half of tortilla. Flip the top of the tortilla down and press down firmly with a spatula. Heat on both sides until golden brown. 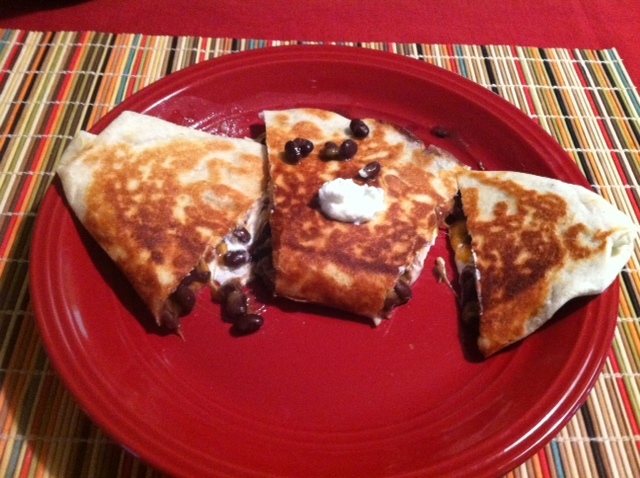 Then, I like to put the tortilla on my plate with a spoonful of Greek yogurt on top and ENJOY! I also added a side salad of lettuce and raspberry vinaigrette for a little bit of a sweet taste! All in all, the whole dinner cost me $10.94 at my local grocery store. I didn’t add in the cost of the coconut oil because I already had a jar on hand. How can you beat dinner for under $11?! I must add that my husband had a second portion and I took my leftovers for lunch the next day, so it really made enough for four adults (my toddler just ate from my plate). I couldn’t get over how easy it was to make after a long day at the office and how crispy the tortilla was from the coconut oil! The meal had such a delicious, light taste that I feel like I could eat this every night for dinner! !